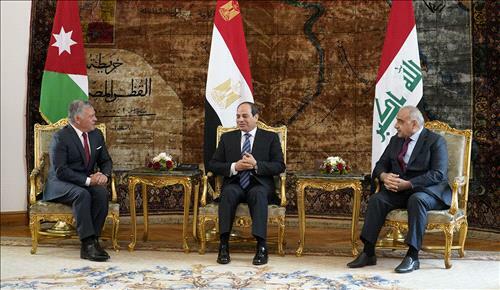 AMMONNEWS - His Majesty King Abdullah, Egyptian President Abdel Fattah El Sisi, and Iraqi Prime Minister Adil Abdul Mahdi agreed on Sunday, during a trilateral summit in Cairo, to advance economic, trade, and investment cooperation. The summit which opened with a trilateral meeting followed by an expanded one attended by senior officials from Jordan, Egypt, and Iraq covered the importance of capitalising on the potential of the three countries’ geographical connectivity and their joint strategic and economic interests. King Abdullah said the meeting is an important opportunity to build on the distinguished ties between the three countries to enhance economic, trade, and investment cooperation, and increase coordination. The three countries, in a joint communique issued after the summit, affirmed their commitment to maintaining strategic cooperation and coordination with Arab countries to restore regional stability and reach solutions to crises, foremost of which is the Palestinian cause, Arabs’ central cause. The communique noted the importance of supporting the Palestinian people in securing all their legitimate rights, including the right to an independent state on their national soil with East Jerusalem as its capital, in line with international laws and relevant UN resolutions. The three counties expressed hope that the upcoming Arab Summit in Tunisia will lead to restoring Arab solidarity and bolstering joint action within the framework of the Arab League. Jordan, Egypt, and Iraq agreed to hold regular trilateral meetings to coordinate positions and policies for the best interest of their peoples and in pursuit of economic prosperity, while cooperating with brotherly and friendly states and building balanced international relations.